We are delighted to announce that following the recent interviews and with the unanimous approval of the parish representatives, The Reverend Dr David McConkey has accepted the Bishop of Peterborough’s invitation to be Priest in Charge. Subject to the normal Church of England legal and administrative procedures he will be licensed after Easter on a date yet to be arranged. Father David has had three parish incumbencies in three provinces of the Anglican Communion. He is currently Team Rector of the parish of Swindon New Town where he has served since 2003. He previously served as Rector of a church in Harare, Zimbabwe where he also lectured in Church History at the National Anglican Theological College. His ordained ministry began in the Episcopal Church of the United States of America. The Archdeacon of Northampton, Bishop Lindsay Urwin (Honorary Assistant Bishop) and the Bishop of Peterborough are very grateful to all who helped with the preparation of the Statement of Need, all the arrangements for the interview day and for the continuing and encouraging ministry of the church in the service of Christ during the vacancy. We ask your prayers for Father David over the next few months as he prepares to move to Northampton. Further to the Archdeacon of Northampton’s official notice, given above, we offer thanks for the interesting points of musical convergence we already share with Fr. David. 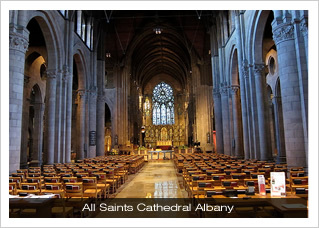 In 2008 the Choirs sang in the United States of America, their third such tour, and on the tour sang at All Saints Cathedral, Albany, where Fr. David was sometime Canon Capitular. We remember this great Cathedral, and the warm and enthusiastic welcome we received from the Bishop of Albany, the Dean of All Saints Cathedral, Albany, and Woodrow Bynum, its Director of Music. the first recording of Guillaume-Gabriel Nivers’ PremierMagnificat. Nivers was Organist at the Église Saint-Sulpice in Paris, where the choirs sang in May 2011, and whose musicians were featured in our most recent summer recital series; Nivers was the subject of Fr. David’s Master of Music Degree from Yale University. 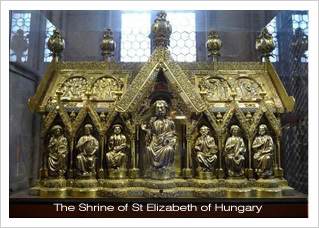 In 2012 the Choirs will sing for the second time at the magnificent Elisabethkirche in Northampton’s twin-town of Marburg, Germany, which contains the Shrine of St Elizabeth of Hungary, the Patroness of Fr. David’s Parish in Harare, Zimbabwe. The final musical link comes with our present Director of Music, whose wife, Dr Hannah Dunleavy, sang in the choir of Somerville College, Oxford, when Fr. David’s own Director of Music in Swindon, Samuel Bayliss, was Organ Scholar. Our Director of Music and Fr. David’s current Director of Music worked together at Somerville College, and with the Cathedral Singers of Christ Church, Oxford, in Oxford, and on their tour to Ripon Cathedral. The Director of Music at Somerville College during Mr Bayliss’s tenure was Francis Knights, who realised the continuo part of the Nivers Magnificat recently recorded by the Girls’ Choir. David Benton McConkey was born on 9 July 1953 in Salina, Kansas. Following primary and secondary education in the public schools of Abilene, Kansas, he attended Kansas Wesleyan University in Salina, from which he received the degree of Bachelor of Arts in 1975. He continued his education at Yale University, from which he received the degrees of Master of Music (for which he presented the thesis Guillaume-Gabriel Nivers: a Musico-Liturgical Study) in 1977 and Master of Divinity (for which he presented the thesis ‘Set your deeds to song’: the Reverend Canon Percy Dearmer and the making of Songs of Praise) in 1979. He served as Organist-Choirmaster of the First Christian Church (Disciples of Christ) in Salina from 1970-75 and again from 1980-84. He was Organist-Choirmaster of St John’s Church, North Haven, Connecticut from 1975-77 and of St Mark’s Church, New Britain, Connecticut, from 1977-79. During the academic year 1979-80 he was Interim Chapel Organist and Associate Director of Choral Activities at Duke University, Durham, North Carolina. He was ordained a Deacon by The Right Reverend John F. Ashby, Bishop of Western Kansas, 28 October 1983, and ordained Priest by Bishop Ashby on 11 July 1984. He served from 1983-94 as Deacon of Christ Cathedral, Salina. In August 1984 he became Curate and Organist-Choirmaster of St Luke’s Church, Anchorage (Louisville), Kentucky, becoming Priest-in-charge of the parish in April 1985. 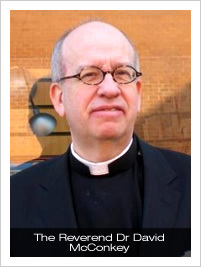 In February 1986 he became Assistant Priest of the Church of the Advent, Louisville. In July 1986 he became Rector of the Church of the Holy Cross, Warrensburg, New York, where he remained until February 1994. During these years he served the Diocese of Albany as President of the Southern Adirondack Deanery, as Canon Capitular of All Saints Cathedral, Albany, and as a Diocesan Trustee. During the Lent term of 1994 he was Visiting Lecturer in Ascetical Theology and Homiletics at Nashotah House, Nashotah, Wisconsin. In June 1994 he began service in the Church of the Province of Central Africa and was licensed as Rector of the Parish of St Elizabeth of Hungary in Belvedere and as Lecturer in Church History at Bishop Gaul College by the Bishop of Harare, Zimbabwe. He remained there until February 2003, serving as a member of the Provincial Synod, as a judge of the Bishop’s Court, and on the Liturgical Committee of the Diocese of Harare, which was charged to produce new liturgical materials in both English and Shona languages for the use of the diocese. He was also Musical Director of the Harare Choral Society. In 2003 he came to serve in the Church of England and was inducted as Rector of the Parish of Swindon New Town on 20 March. He is currently a member of the Standing Committee of the Swindon Deanery and of the Diocesan Synod in the Diocese of Bristol. He is a Founding Director of the Swindon Food Bank. His Doctoral Thesis may be perused here.